During Lauren Kuby’s first run for Tempe City Council, she led most to believe she cared about the community and individual neighborhoods. We know now that is not the case. What is worse, she doesn’t really care about the safety of Tempeans or Arizonans in general. We have spent the last few months watching her lay out her second run for Council and we can no longer give Ms. Kuby the benefit of the doubt. Although Tempe’s elections are bipartisan, it needs to be known Lauren Kuby is registered and involved as an active Democrat. The Democratic Party was once a Party of the little guy. Many in the country looked to them as the Party who helped the poor and needy. That Party no longer exists; those good intentions have been hijacked by a powerful and well-funded network of people whose ultimate goal is the demise of the United States of America. For many people this is hard to hear. This group is not shy about calling themselves Progressives, in other words the Constitution is a fluid document and can be interpreted as anyone sees fit. No operation can run that way. Think about your own place of business. When hired, an employee is given responsibilities, a code of conduct, a mission statement, and company rules to follow or else. Teachers set rules and boundaries the first day of school so there is no doubt what the expectations are of the students. Even when people volunteer at a non-profit there are rules to follow or they will be asked to discontinue volunteering. Lauren Kuby has rules to follow as an employee of Arizona State University. Her department has guidelines. She can’t change the rules as she goes, nor can her coworkers and students. Nothing can be maintained with chaos. Because those who don’t like our Constitution are so desperate to change it, they make up their own rules and standards. It takes a moral compass to live with the free will our Constitution allows. There is a process built in to the Constitution to change it, our Founding Fathers saw to that. Amendments have been adopted 27 times since our founding, including women’s right to vote. Why don’t these Progressives use the amendment process? There are probably a variety of reasons but one is the time it takes. Again, our Founding Fathers were smart. Instead, Kuby and her well-funded, radical fringe groups impose pressure and incorrect rhetoric on the culture and most people buckle. In a relatively short period of time, we now live in a country we no longer recognize. It doesn’t matter to those involved, during the process they successfully gain votes, money, and political power. Let’s look at some of the groups Lauren Kuby has befriended. Sanctuary Cities–It wasn’t long ago when we were horrified by the murder of Kate Steinle in San Francisco at the hands of an illegal immigrant who the city chose to protect. 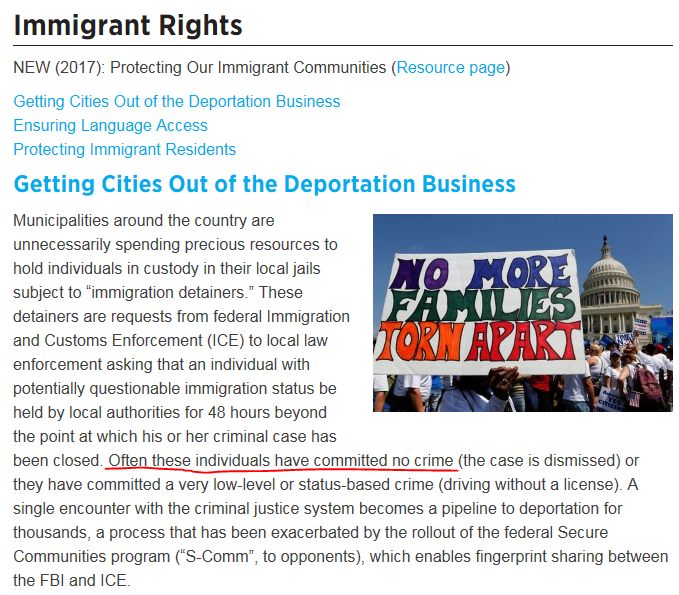 Our very own Lauren Kuby is a member of Local Progress, who is supporting Sanctuary Cities. 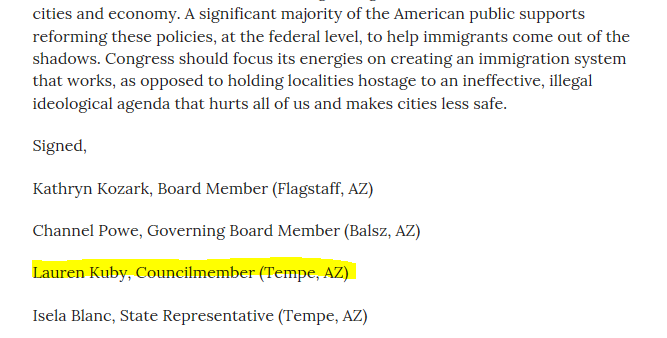 Her name is on list of municipal leaders across the country who support Sanctuary Cities instead of local and federal laws designed to protect all citizens. CAIR–After a terrorist attack, we regularly see the Council on Islamic Relations (CAIR) take to the airwaves defending themselves and telling the rest of of us they don’t support violence and terrorism. The problem is CAIR is a front for violent terrorist groups like Hamas and the Muslim Brotherhood. It’s not a surprise Lauren Kuby won a seat on Tempe City Council in 2018, but it would be a disaster for Tempe residents give her a second term now that we know her heart really isn’t in Tempe, Arizona, or the United States.